FILE - Girls carry water on their bicycles at a dispensary in Nedogo village near Ouagadougou, Burkina Faso, Feb. 16, 2018. The Burkina Faso government claims to have killed 146 jihadists in the country's north this week, but Human Rights Watch says it believes some of the dead are civilians. The military is also implicated in dozens of extrajudicial killings in the same region. "It is entirely possible that a good number of those people that the army are alleging are so-called terrorists are in fact civilians or suspects who were killed unlawfully," said Corinne Dufka, Sahel director at Human Rights Watch. "I spoke with a few people with knowledge of the incidents. One of them described speaking with women who were weeping, talking about how their husbands had been taken from their homes and killed in front of them." The nation's army commander reports Thursday that terrorists killed five paramilitary police and wounded three others in retaliation for this week’s counterterror operation. 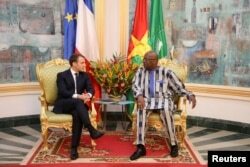 FILE - French President Emmanuel Macron attends a meeting with Burkina Faso's President Roch Marc Christian Kabore at the Presidential Palace in Ouagadougou, Burkina Faso, Nov. 28, 2017. While terror attacks are on the rise in Burkina Faso — there have been more than 200 since 2015 — the military is accused of committing human rights abuses in the name of fighting terrorists. "The local population consistently described to me being between a rock and a hard place, being fearful of the army and the Islamists, wanting to live their lives in peace, but feeling they are blamed by the army for collaborating with the Islamists. But when the Islamists come into town, they felt pressure to sell goods to them," added Dufka. Before 2016 the Sahel country had — on the surface — been a stalwart of peace and stability. "The old system protected them and fed them," said Serge Bambara, spokesperson for Balai Citoyen, a protest group that helped lead the movement to topple Compaore in 2014. According to International Crisis Group's (ICG) West Africa project director, Rinaldo Depagne, those deals deteriorated after Compaore's government was ousted in a popular movement to sweep in reforms. "When the insurrection in October 2014 happened, and then when the military transition took place in 2015, it became more and more difficult to keep those deals between Burkina and terrorist groups, and then they started to operate in the country," said Depagne. The insurrection is led by the homegrown militant group Ansarul Islam, and according to ICG, the attacks continue to take a heavy toll on government forces in the country's north, while in 2018, a second hotspot emerged in the east. The threat is not necessarily based just on religious extremism, he said, but also on the communities' deep frustrations over being denied development. Despite rising costs of living, the country's minimum wage is capped at $55 per month, and most rural areas lack basic infrastructure. "There are more important questions, questions of infrastructure, of health centers. The people feel left behind. There are a lot of regions who are left out of the system, and all that can create a form of frustration that feeds into the recruitment for the jihadists," said Bambara. "There is an area of insecurity, where some health posts are closed or function with very few medical staff," said Sylvien Auerbach, head of MSF's Burkina Faso operations. "And those staff are not sufficient to meet the needs of the population in that area." "We can assume that the coverage of vaccination now is getting low because of the difficulty to reach the points of vaccination outside of the health posts," added Auerbach. "We have observed this in some other parts of the Sahel, is that these groups are very at ease when the situation is uncontrolled and to a certain extent those groups are also presenting themselves as service providers, especially in terms of security against other communities," said Depagne. "I heard very credible accounts from families of how their extended family members who were forced to flee northern Burkina Faso, and they believe that some of them have joined with the armed Islamist groups," said Dufka. "It's quite clear that the Islamists since 2015 have targeted the Fulani for recruitment. The Fulani are mobile, they are present in a number of West and Central African countries. They have deep grievances with the state in a number of different places, so I think this is part of their expansion strategy," added Dufka. "Sy already made an important declaration and put an important problem directly on the table," said Depagne, adding, "The fight against terrorism in the nation can't be properly done if you don't have a good relationship between these two parts of society - the military and the nation." One hurdle in their battle is that the militant groups' ideology and long-term goals are hard to pinpoint. That lets us think that those groups are connected and are sliding from one region of Burkina to another one," added Depagne. "We say that a program, a real strategy of defense must also be put in place with a real will to transform this region, that these solutions exist for the populations so they can not be easily recruited," he said. Meanwhile, outside analysts fear the violence could continue to spread, beyond Burkina Faso's borders and into neighboring countries.